SEATTLE, July 6, 2018 /PRNewswire/ -- Alaska Airlines begins nonstop service today between Mineta San Jose International Airport and John F. Kennedy International Airport in New York City. With the addition of the new service, Alaska now operates 15 flights a day to JFK from six West Coast gateways including Las Vegas; Los Angeles; Portland, Oregon; San Francisco; San Jose; and Seattle. The new route builds on Alaska Airlines' largest network growth in the company's 85-year history and solidifies Alaska as the leading airline of nonstop flights from the West Coast. "Through the power of our network, Bay Area flyers now have convenient, nonstop coast-to-coast flights, connecting guests between two of the largest business economies in the country and to Europe on our Global Partner airlines," said Annabel Chang, Alaska Airlines' vice president of the Bay Area. "JFK-bound guests traveling from San Jose today will be treated to a New York-themed breakfast, prizes and special send-off, all part of our award-winning customer service." With the addition of this new and expanded JFK service, Alaska provides 38 daily flights to 19 nonstop destinations from San Jose. "We mark a significant milestone with Alaska Airlines today by offering new daytime, nonstop service to New York's JFK airport," said San Jose Director of Aviation John Aitken. "New York is the No. 1 requested U.S. destination by business and leisure travelers departing from Silicon Valley's airport. This new flight complements our existing airline service to the New York area, and gives our customers more airline and flight schedule options to best meet their travel needs." Timed with the flight expansion, Alaska's newest Lounge is now open on the mezzanine level of Terminal 7 at JFK, offering a warm, welcoming experience with multiple seating areas, handcrafted espresso and full-leaf tea beverages, complimentary fresh foods, and a wide-selection of microbrews, West Coast wines and signature cocktails. 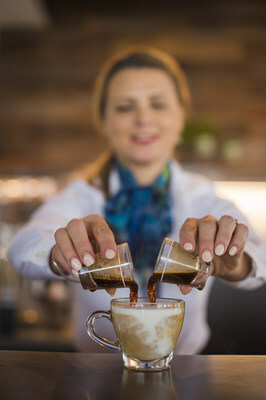 Alaska is the only domestic carrier to offer all paid First Class guests complimentary access to the lounge, and the first domestic lounge to introduce a full menu of barista-pulled handcrafted espresso beverages. "I'm excited to join Alaska Airlines in welcoming their new, direct daytime service out of San Jose, to New York-JFK," said San Jose Mayor Sam Liccardo. "I'm grateful to CEO Brad Tilden and his entire Alaska team for their continued investment in destinations that are high priority for Silicon Valley's business and leisure travelers." 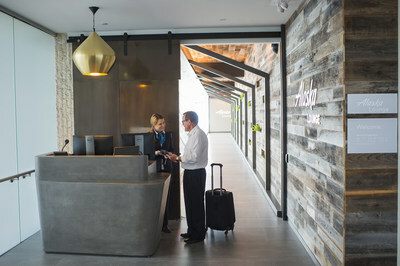 Alaska gates and the Alaska Lounge are located in the same terminal as Global Partners British Airways and Icelandair, providing guests traveling through JFK with convenient access to a combined 10 daily flights to top global destinations across Europe. Members of Alaska Mileage Plan can travel and earn miles to more than 900 destinations around the globe through a unique network of international partners, with many flying out of JFK. To purchase tickets, visit alaskaair.com to find great savings, or call 1-800-ALASKAAIR (800-252-7522 for Hearing & Speech Impaired (TTY): Dial 711 for Relay Services).